Dublin has a lot of quays. It’s a river thing. This is Lower Ormond Quay with the Boardwalk visible there just before it ends by Capel Street. I walk the quays a lot so don’t be too surprised to see more quays ending up in paintings. This painting, Ormond Quay. is now SOLD. 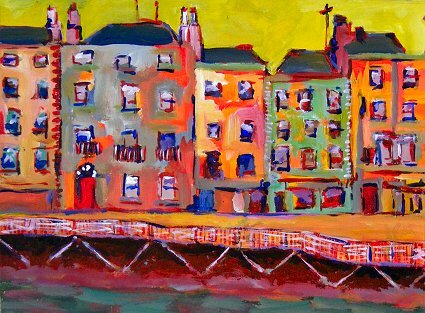 Ormond Quay is part of the End of Year 2009 online sale of paintings, which has launched with paintings at half-price and FREE shipping worldwide until Christmas Eve. Dozens of new paintings are being rolled out on my personal blog Bicyclistic in batches of 5, 6 and 2, 3. To see announcements first follow me on twitter.